With all its glitz and sparkle, aventurine (avventurina) stands out as a flamboyant extrovert among the varieties of glass that were developed and perfected on the Venetian island of Murano. Also known as 'goldstone', it consists of a transparent base glass with myriad reflective crystalline "spangles" running throughout. The classical version is a deep golden brown with crystallites composed mainly of metallic copper, with a few related compounds as supporting cast. However, numerous colors have been developed, including red, orange, yellow, green, blue, violet, black and white. Folklore holds that aventurine was discovered by accident ("a venturi") when unknown monks inadvertently dropped copper or brass shavings into a glass melt as early as the thirteenth century. However, more thorough investigations have recently identified 1620 as a likely date for the first appearance of aventurine glass. No example or written account has been found that dates prior to the seventeenth century. An alternate story accounts for the name aventurine being derived from 'adventure'; referring to the difficulty and uncertainty involved in its production. At first, the formula was a closely held secret among a few glassmakers and subsequently it was lost and then rediscovered not once but twice. To complicate matters, natural minerals with a similar appearance were named after the glass, leading to the misconception that they were also discovered after the glass was invented. This is clearly not the case. Early examples of mineral aventurine artifacts date to the Neolithic era  and can be found throughout history. First century Roman writer Pliny mentions a type of stone with silvery flecks, a passage that was well known when the glass was developed. The compositions of these minerals were also identified early; either species of quartz that contain flecks of mica, or a type of feldspar (sunstone). Mineral aventurine turns up as the eyes of Greek statues, in stonework mosaics and later in the 'pietre dure' art perfected by the Medici artisans in Florence around the time Antonio Neri started making glass there. 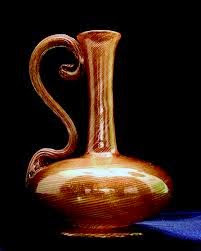 The chances are good that examples of the mineral were known to Neri as well as to the glassmakers on Murano, but a recipe for the glass version does not turn up in Neri’s 1612 book; he was apparently too early by a decade. The story of aventurine's accidental discovery by monks may well be apocryphal; nevertheless, it is a great entrée to understanding how the formulation works. First, contrary to what the story implies, aventurine is not the result of dumping metallic confetti into glass. The reflective "spangles" (as early researchers were fond of calling them) are actually uniformly sized, mirror-like crystals that are grown in the glass. In truth, the formula is quite similar to recipes already in use by Neri and others; the difference was in proportions and in how the glass was treated after it was in the furnace. The formula for aventurine calls for the addition of copper, iron and tin oxides, to a base that was a hybrid of soda, potash and lead glass. Neri’s recipe #128 is titled "A Proven Way to Make Rosichiero"  and provides for all of these ingredients, albeit in lower concentrations. Rosichiero was a transparent tawny red colored glass that was a staple of furnaces throughout Italy. The secret to producing the reflective "spangles" was to mix the glass and heat it in the furnace in a normal way, but then to slowly reduce the heat while creating a low oxygen “reducing” atmosphere. The furnace draught was shut; the glass pot was fitted with a tight lid and then covered with ashes and allowed to cool very slowly. Initially, the batch is saturated with copper oxide. This means the glass has dissolved as much copper, iron and tin as it can and any further addition of these powders will simply float to the bottom of the pot. The exact amount of powdered metals able to dissolve is a function of temperature; the hotter the glass the more that will dissolve and the cooler the glass the less that will dissolve. The key concept here is that as the glass slowly cools, the metals start to come out of solution and crystals start to form. There is some complex chemistry happening at the same time; the reducing atmosphere encourage the metals to stay in a pure un-oxidized form, Furthermore any oxygen or sulfur that happens to be present will preferentially combine with the iron, leaving the copper crystals pristine. Once cooled to room temperature, a successful batch would be broken away from the glass pot by workers and divided into smaller pieces. Glass artisans wanting to incorporate the aventurine into their work needed to work quickly. They carefully reheated an appropriate nugget and coated (encase) it in a layer of clear glass; once molten, direct exposure to the air would destroy the glittery effect. Over time, it was discovered that various colors could be produced with the addition of different chemicals, but the central principal of growing tiny metallic crystals is the same. The earliest instance of this story in print that I can find is fairly late; Faustino Corsi, Delle pietre antiche: libri quattro (Rome: Salviuccio e figlio, 1828) pp. 166-167. Cesare Moretti (†), Bernard Gratuze and Sandro Hreglich, “Le verre aventurine (‘ avventurina ‘) : son histoire, les recettes, les analyses, sa fabrication”, ArcheoSciences, 37 | 2013, 135-154. Neolithic Quartz Aventurine Pendant - 7 Cm/ 2. 76 ", green - 6500 To 2000 Bp – Sahara. Item Id: 106549, Weight: 83 gm. Sahara - Mauritania - Tagant country. Dizionario del cittadino, o sia Ristretto storico, teorico e ..., Volume 1 pp. 38-39. Antonio Neri, L'Arte Vetraria (Firenze: Giunti, 1612). Sauzay, A. (1870) Marvels of Glassmaking in All Ages. London, 1870 pp. 173 - 175.